MCDONALD'S has been accused of "technology discrimination" after the fast-food giant ditched its paper loyalty cards. The change has been gradually phased in over the past few years but has been national for the past six weeks. Customers now have to download the MyMacca's app to access the popular "buy five, get one free" deal. 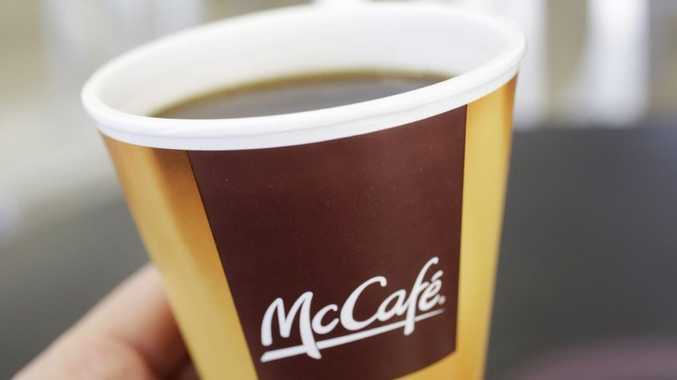 With more than 800 locations and around a quarter of a million cups of coffee sold every day, McDonald's is Australia's largest, and therefore "most popular" coffee chain. Unsurprisingly, many customers are unhappy at the change. Some have reported glitches resulting in lost "stamps", while others complain that it unfairly impacts older customers. One customer told news.com.au he still used an eight-year-old HTC Desire phone, which is unable to run the latest apps. "That cuts me out from the loyalty system immediately," he said. "Then I thought of the many people that just use a flip phone - they'll be left out too. And also the many older folk that don't bother with mobile phones. This is 'technology discrimination'." Customers took to McDonald's Facebook page to complain. Say goodbye to paper cards. "The new coffee rewards system is ridiculous," Mel Clarke wrote. "My mum at 68 doesn't buy data for her phone so can only use the app reward system with Wi-Fi which half the time isn't working. And for some unknown reason the four that she got disappeared when we connected yesterday. She would have been up to her free one now but has to start again. This isn't a reward system for a lot of people anymore." Renae Cooper said she was "hating your new coffee rewards on the app". "Fourth time I have gone and the app wasn't working," she wrote. "Not happy." Madeline Elizabeth agreed that the app "rarely works". Alistair Rainey said he was "disappointed" with the move. "I knew the app wouldn't work as I've had issues before," he said. "I went along with it and yep the app needed updating and I've lost the four stamps I had collected. Now I'm back to zero. Think I'll have to find another coffee shop." 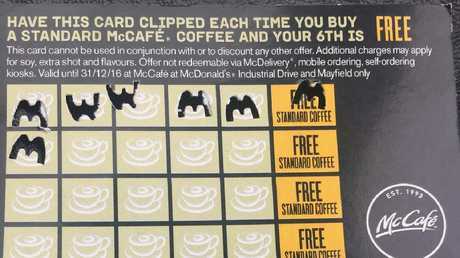 A spokeswoman told news.com.au McDonald's had received "great feedback from customers on the app and more people than ever before are taking advantage of our coffee loyalty program". "We're proud to always offer our customers great value regardless of whether they are dining in our restaurants, using our MyMacca's app, or ordering McDelivery through UberEats," she said. "Customers with a seniors card continue to be able to take advantage of offers which entitle them to a free coffee, juice or soft drink with a purchase in our participating restaurants."